This rice-thickened French classic, known as Potage de Crécy, is simple and comforting. Serves 6. 1 cup toasted croutons for garnish. Heat the butter and olive oil in a large, heavy soup pot over medium-low heat and add the onion. Cook, stirring, until tender, about 5 minutes. Add the carrots and ½ teaspoon salt, cover partially and cook for another 10 minutes, stirring often, until the vegetables are tender and fragrant. Add the rice, water or stock, salt (about 1½ teaspoons) and sugar. 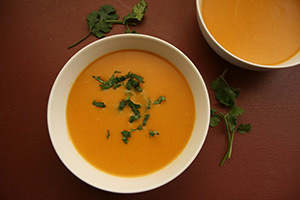 Bring to a boil, reduce the heat, cover and simmer 30 minutes, or until the carrots are tender and the soup is fragrant. Blend the soup either with a hand blender, in batches in a blender (cover the top with a towel and hold it down to avoid hot splashes), or through a food mill fitted with the fine blade. The rice should no longer be recognizable (it thickens the soup). Return to the pot. Stir and taste. Adjust salt, add a generous amount of freshly ground pepper and heat through. If the sweetness of the carrots needs a boost, add another pinch of sugar. Serve, garnishing each bowl with croutons and a sprinkle of herbs. This soup can be made hours before serving, or a day ahead, and reheated. VARIATION: Substitute 1 medium Yukon gold potato or ½ russet potato (about 5 ounces), peeled and diced, for the rice.